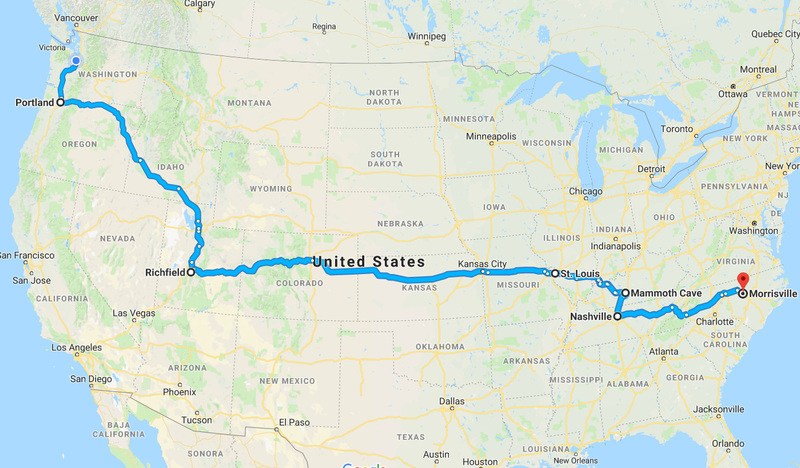 I started my road trip by driving westward to the North Carolina/Tennessee border. 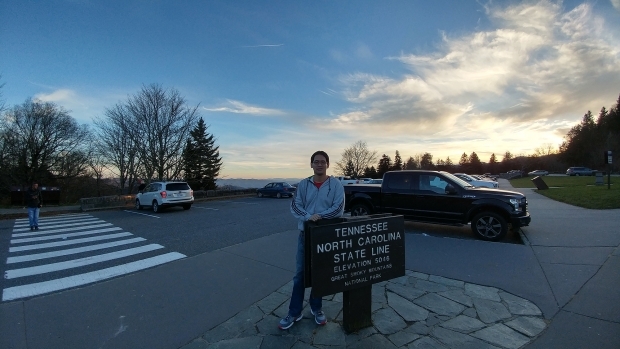 I could have chosen the faster route and stayed on I-40, but decided to take the scenic route and drive through Great Smoky Mountain National Park. I’ve been to the park twice before, but this was the first time I drove all the way through the park on the US 441. As it was getting late in the day, we only stopped by the Newfound Gap which marks the border between NC and TN. It was fall foliage season, but at all the trees were brown or bare at the elevation of the gap. I took a picture with the state border sign to mark the fact that I was moving out of North Carolina, and it might be be a while until I return to the state. Driving all the way through national park brought us to the mountain resort town of Gatlinburg, TN. I’ve visited Gatlinburg 4 years ago, and Gatlinburg is still as I remembered it. Even on a chilly weeknight, there were plenty of people walking around on the main street checking out the restaurants and entertainment options. 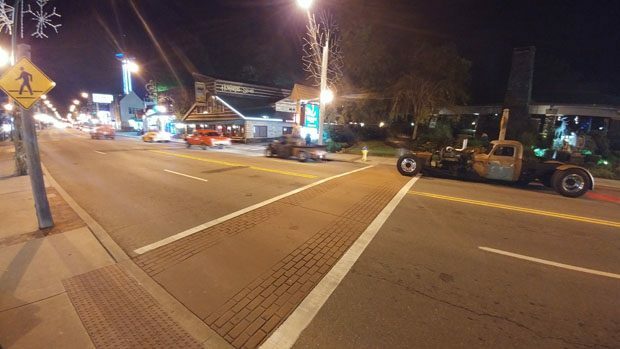 When we were there, there were a group of hot rods driving up and down the street as an impromptu parade. It’s a fun little town to visit for people who want to go to the Smoky Mountains. We continued to head west on the I-40 until we hit Nashville. Being Tennessee’s state capitol and largest city, Nashville is also known as “Music City” and is the center of America’s country music scene. 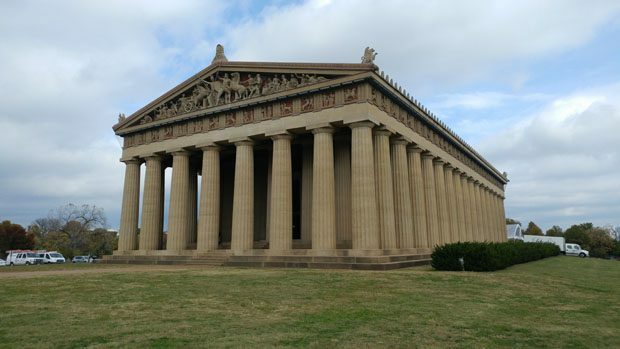 Our first stop in the city was Centennial Park, known for its 1:1 scale replica of the Greek Parthenon. 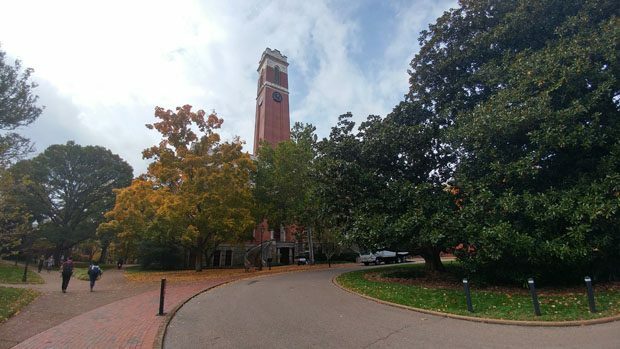 To the south of the park lies the campus of Vanderbilt University, named after Cornelius Vanderbilt, once the wealthiest man in America. It’s a pretty big campus and has a couple of buildings with that nice classical architecture. We then headed into downtown Nashville. 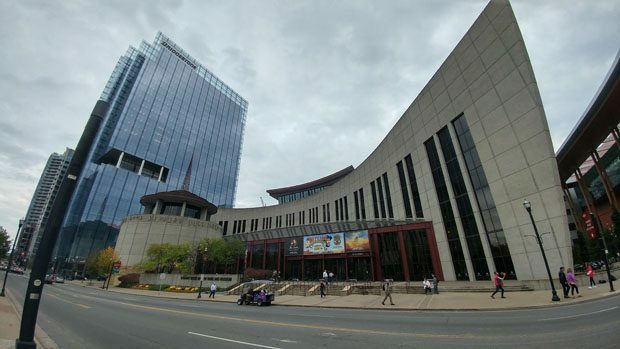 Given Nashville is the center of the country music scene, it makes sense that the Country Music Hall of Fame is located right in downtown. 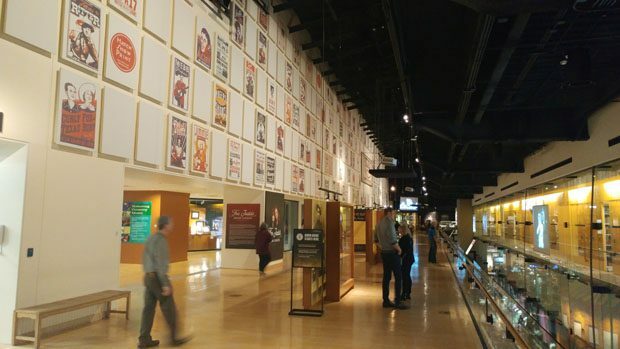 It’s a mid-sized museum with some interesting exhibits on the history of country music, contemporary artists, and of course the hall of fame itself. I am not a huge country music fan, but recognized a few names from the hall of fame plaques. There are a whole bunch of other music-related museums in the city, but we didn’t have time to visit them this time. 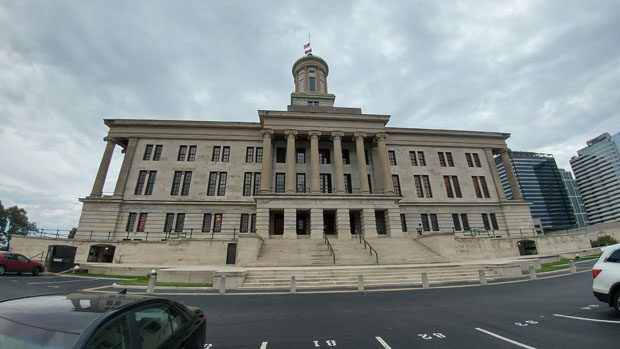 Other than being the Music City, Nashville is also the state capitol of Tennessee, and thus we walked up to the state capitol building to take a closer look. 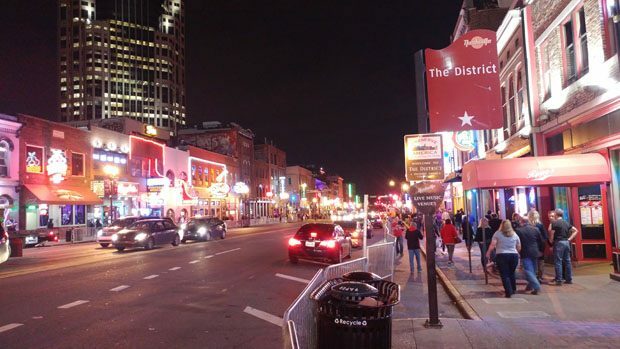 Other than all of the music-related museums, another reason Nashville is known as the Music City is the District, aka the Honky Tonk Highway. The District is several blocks of Broadway filled with historic buildings that have honky tonks (country music bars) that have live performances every day of the year. By night, the whole street is filled with the lights from all the neon signs and the music from all of the live performances. It’s a very lively place that is definitely worth a visit even for those who are not fans of country music. One more thing that Nashville is known of is its “Hot Chicken”, which is fried chicken with a light coating of hot sauce. 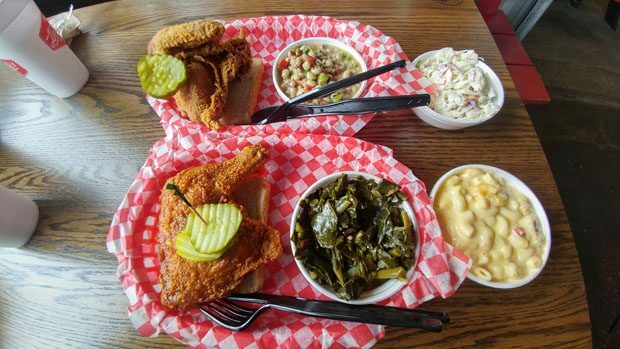 We tried Hattie B’s, which is one of the most well-known Hot Chicken chains in the area. I got my chicken with medium heat, and it definitely had some spiciness to it. It was pretty decent fried chicken. Nashville’s signature hot chicken. Tasted like spicy fried chicken. From Nashville, we took a little detour an hour northwest into Kentucky to visit Mammoth Cave National Park. Mammoth Cave is the longest cave system in the world, with over 400 miles of documented passages. 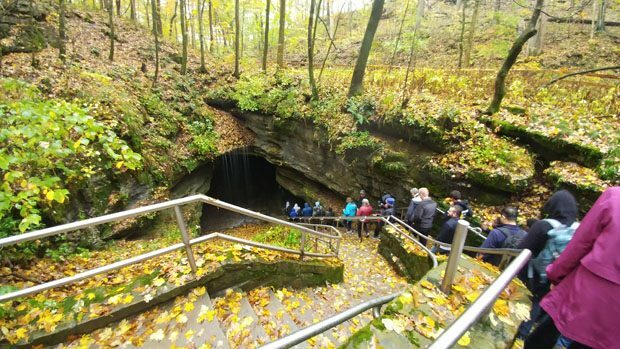 Seeing all 400 miles is impossible for most visitors, and so we opted for the 2-mile, 2-hour Historic Tour that explore some of more historic significant passages within the Mammoth Cave system. The tour starts with a trek from the visitor center to the historic entrance of the cave, and from there we entered into a whole another world. Unlike some of the other caves I’ve toured, the portion of Mammoth Cave we visited is not known for its stalagmites and stalactites, but there is a lot to see. The first portion of the tour features the biggest natural caves I’ve been in, with a half-acre room called the Rotunda Room being the center piece. It was an easy walk in this part of the cave, but then we came upon a set of narrow stairs that led deeper underground. From that point on, we went through tunnels with both narrow sides and low ceilings. For a tall guy like myself, this became a bit of a workout trying to make sure I don’t bang my head into the ceiling. 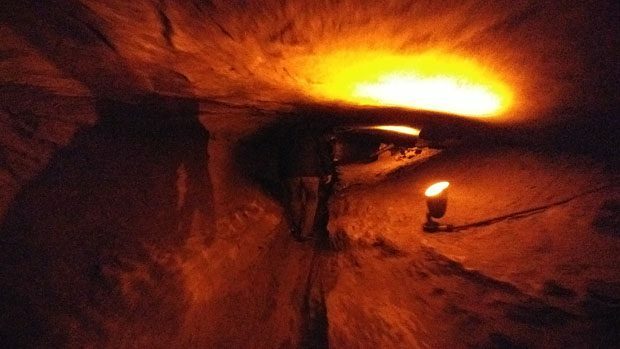 There is an apty-named section called “Fat Man’s Misery” which has both low ceilings and a narrow waist-height channel that forces people to duck and shuffle sideways at the same time. That part of the tour definitely got me sweating a little bit. This is truly a Fat Man’s Misery. Probably should not visit if you are claustrophobic. 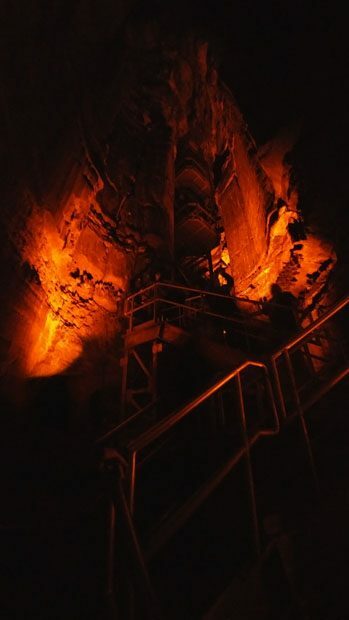 After all of the constant ducking and near-crawling, we walked over two deep pits and came upon the tall Mammoth Dome chamber, where a set of metal stairs lit up in eerie red light that led back up towards the bigger tunnels near the entrance. Overall, the Historic Tour in Mammoth Cave was more of an adventure than I had expected, in a good way. It’s definitely bigger and different than the other caves I’ve toured, and you definitely have to be in decent shape to go on this tour. 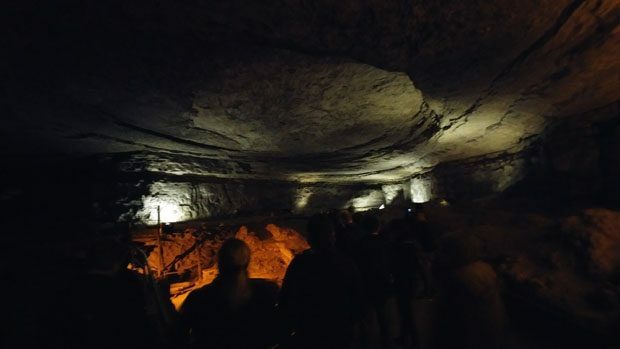 Mammoth Cave does offer several other tours, including an accessible tour. I definitely wouldn’t mind coming back to the park and taking a different tour. We continued driving to the west through the southern portions of Illinois and Indiana until we reached the city of St. Louis, Missouri. Situated on the Mississippi River, St. Louis is known for their blues music, barbecue (particularly ribs), and the Gateway Arch. We didn’t experience the blues music, but covered the latter two. Standing 630 feet tall and wide and clad in stainless steel, the Gateway Arch is the tallest monument in the Western Hemisphere and is a prominent feature of the St. Louis skyline. The monument commemorates the westward expansion of the United States, and it is an impressive and distinctive piece of engineering. 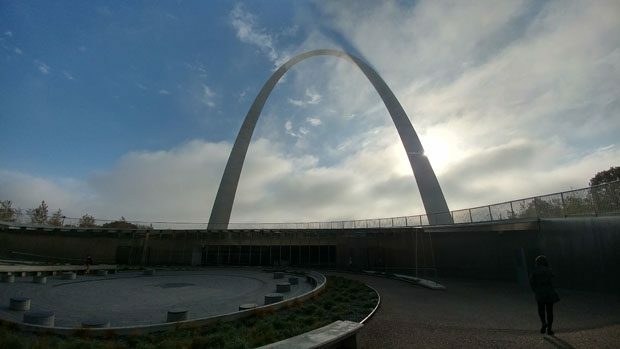 Now part of the Gateway Arch National Park, visitors can learn the history of the arch in the museum at the base, or ride the trams (one in each leg) up to the observation area at the top of the arch. 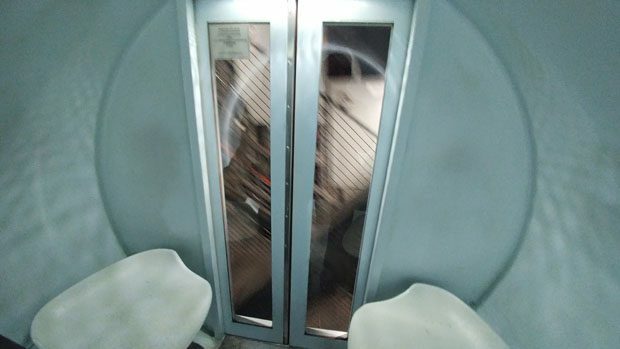 Each tram consists of 8 circular pods of about 5 feet in circumference linked together, and this allows the tram to navigate up the curved legs of the arch. Each pod has 5 seats, but from experience it’s definitely a bit of a squeeze if 5 adults ride in the pod. The tram ride took us to the observation area at the top of the Gateway Arch. Since observation area is on top of the arch, it has a curved floor. 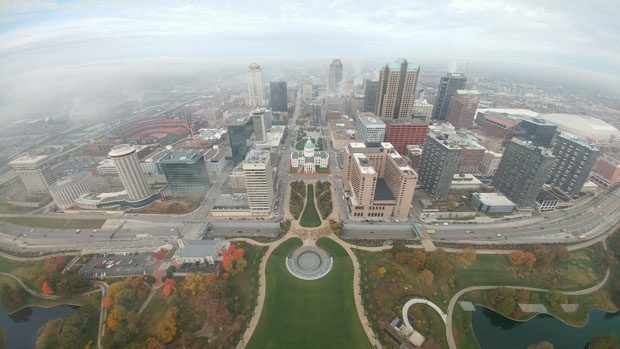 The observation windows are a bit small, but from them you can get unobstructed views of St. Louis’ downtown on one side, and of the Mississippi river and Illinois on the other. 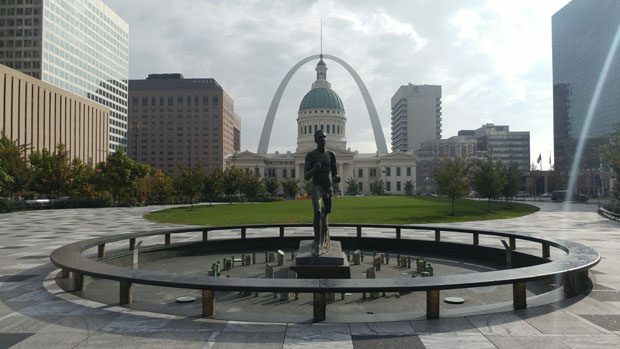 In addition to visiting the Gateway Arch, we walked around downtown St. Louis a bit, and went to the Old Courthouse to get the photo of both the Courthouse and the Gateway Arch together. 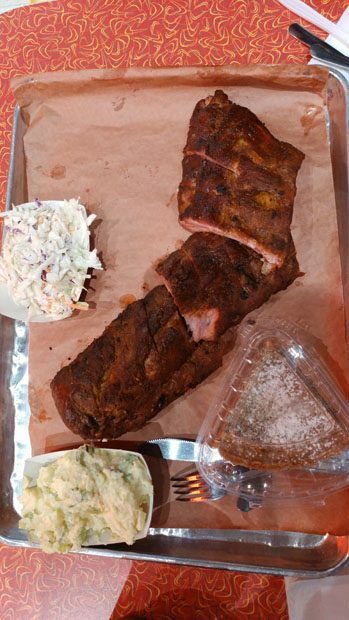 We also tried some of that famous St. Louis Ribs. A whole rack of delicious baby back ribs was enough to satiate our appetites. From St. Louis on the east side of Missouri, we drove all the way through the state to Missouri’s western borders to Kansas City. Before I learned better, I always thought Kansas City was in Kansas. There is a Kansas City, Kansas (sometimes abbreviated as KCK), but it is part of the metro area centered by the larger Kansas City in Missouri (abbreviated as KCMO). 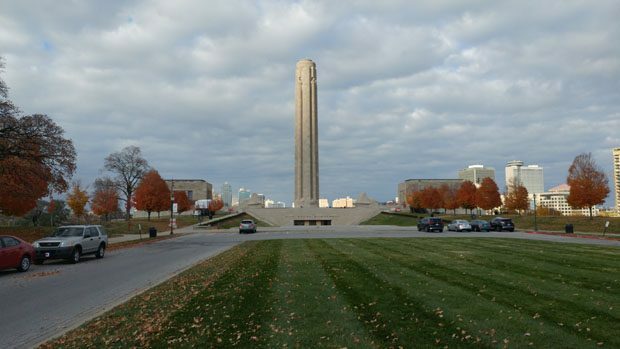 While in KCMO, we visited the National World War I Memorial located south of downtown. It’s a beautiful and stately park, with a large stone monument and museum building to remember the sacrifices made by American soldiers during the first world war. 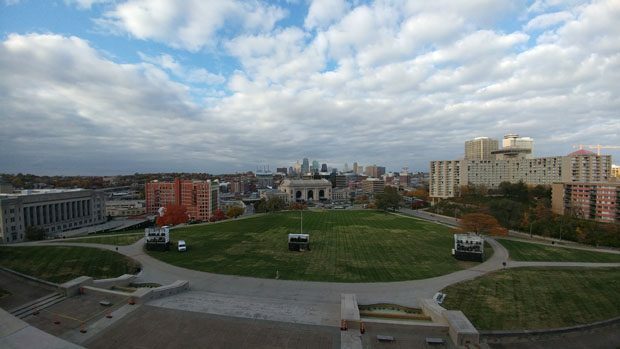 From the north side of the building, you can get a great view of Union Station and downtown KCMO. We also stopped by the upscale shopping area of Country Club Plaza in the midtown area of the KCMO. Despite the name, the place is neither a country club or a plaza, but it is several blocks of Spanish-styled buildings with shopping, dining and other commercial enterprises. It was pretty busy, but they had a few big parking garages so parking wasn’t an issue. We walked around, and ended up having some Kansas City barbecue for dinner. 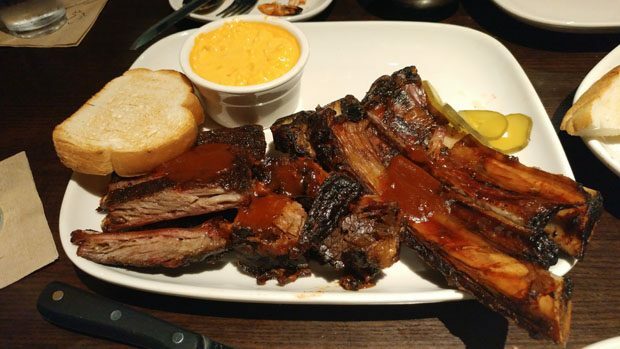 We tried the burnt ends that KCMO is known for, along with some other barbecued meats. It was definitely a satisfying dinner.